What’s your perception of Thatchers as a cider maker? Until recently, while I knew that they were a family-run cider company, I just thought of them as a huge commercial manufacturer, just pumping out cider on a massive scale. That’s true: they ARE massive, especially compared to some of the other local cider producers who are basically just one guy, some apple trees and a barn. But after a recent visit and tour along with other Bristol bloggers, where I learned a lot more about their history and how they operate, my perception has definitely changed. On a miserable, rainy Saturday, a bunch of us headed down to Myrtle Farm in Sandford for a tour, tastings, lunch at The Railway Inn on the Thatchers premises (lunch review is now online here), and a swift trip to their gift shop before we headed home, learning plenty along the way from their marketing manager, their orchard manager, their tour leader, The Railway Inn’s general manager and one of their latest batch of new recruits. The Thatchers story actually began all the way back in 1904, when William Thatcher – owner of Myrtle Farm – started to make cider for the farmhands to enjoy alongside bread and cheese at the end of the working day. Back then, the farm was just a farm – but as new generations came to the fore, things started to change. William’s eldest son, Stan, pioneered the commercial side of things when he took over the reins, selling to inns and markets within a 4-5 mile radius. And things just kept growing from there. In 1970, Stan’s eldest son, John, used his keen interest in and knowledge of orchard management to evolutionise the orchards, and Myrtle Farm started to make more money from cider than from farming for the first time. In 1992, John’s eldest son, Martin, took the helm, and he’s still there today. The business keeps growing from strength to strength – but while Thatchers can be found throughout the South West, they’re looking to expand their presence elsewhere in the UK. And it looks like the business will stretch into the fifth generation too, with both of Martin’s teenage children interested in carrying the legacy forward. Myrtle Farm isn’t a small place. 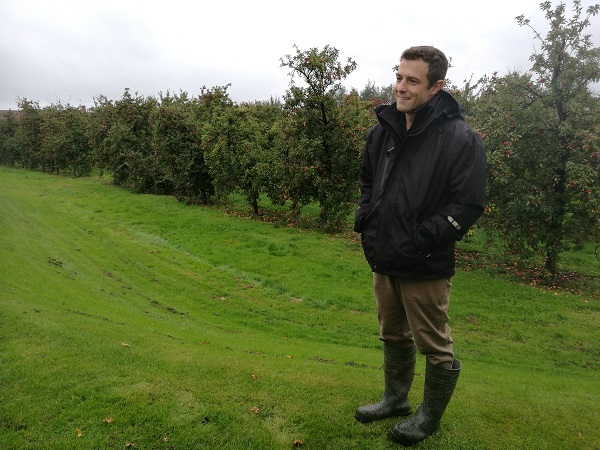 It’s home to 500 acres of orchards, all overseen by orchard manager Chris. Here, they grow both cider and eating apples (both of which are used in their ciders), with 25 main varieties – and 460 in total. Why so many? Well, when Long Ashton’s former cider research station lost its funding and was forced to close, John Thatcher recognised just how much potential was about to be lost. 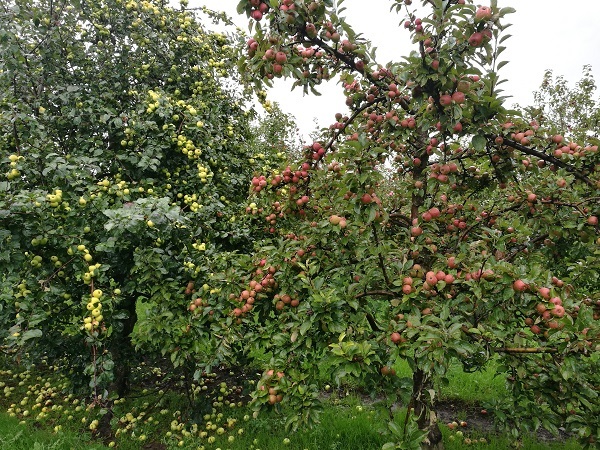 The Long Ashton site had developed a huge number of apple varieties, and the Thatcher’s Exhibition Orchard is dedicated to saving them, with the aim of developing new ciders under their brand name. Here, they’ll grow fruit and make a test batch of cider before gauging consumer opinion. If it’s a hit, they’ll look to increase the number of trees to craft the cider on a larger scale in the future. It’s not a quick process, though. A single tree will take 8 years to produce a full crop, so the Thatchers family are constantly looking to the future. But with an expected productive lifespan of 25 years, once they’ve nurtured a tree through to maturity, it’ll keep on giving for years to come – providing, of course, that it’s well looked after. We visited at the perfect time of year: mid-harvest. The Thatchers harvest starts at the end of August with the Katy variety, and ends in November – it certainly keeps them busy! In the Exhibition Orchard, some trees had already been stripped of their fruit, while the laden branches of others were clearly not far from the start of the cider making process. Once you get through the Thatchers orchards to where the cider is actually made, it’s like stepping into a totally different world: one of industrial vehicles and machinery, huge production facilities and a truly ridiculous number of apples. Those apples aren’t all from the Thatchers orchards: to make cider on their kind of scale, they need more than the 35,000 or so tons they grow each harvest. Around a third of the apples they use each year are their own, with the rest bought in from farms within an 85-90 mile radius. They currently work with around 35 farms, and obviously they want the quality of the apples they receive to be top-notch. And that’s why they share any relevant information with these farms to make sure both the quality and the volume of their crops is as high as it can possibly be. In this harvest alone, Thatchers are expecting to receive between 700 and 750 lorries full of apples – and they treat the farmers incredibly well. Not only do they pay the week after delivery (90 days quicker than any other cider maker), but they offer a bonus payment if the apples a farm supplies are not only extra clean, but extra ripe too – with ripeness determined by the level of starch measured in a small sample tested by Thatchers. Once the apples come in, they’re cleaned and sent straight to the presses for juicing – as Phil explained during our tour, there’s no point in hanging onto them if they arrive in the perfect condition. This summer alone, the team will be pressing 63-65m litres of apple juice, with around 75% of the total fruit ending up as juice. The rest – the skins and pips – form something called pomace, which isn’t wasted: it’s used as cattle feed. This juice isn’t all used at once, though – it’s used to make cider all year round. But storing that quantity of apple juice would require a LOT of space…instead, each apple variety is concentrated down and stored separately – and rehydrated when needed. The juice is filtered, then the fermentation begins in a futuristic-looking hall of huge metal tanks. Fermentation is a far quicker process than I thought – it takes just 7-8 days – and all it requires is juice, yeast, and plenty of monitoring to ensure that the acidity, temperature, pressure and other factors are just right. It’s then filtered again, and if they’re making a cider that’s a blend of apples, that’s when the blending will happen. Why not before fermentation? Well, because their Gold cider, for example, is a blend of eating and cider apples, which ferment at different rates – blending before fermentation would lead to very different (and probably not as nice) results. 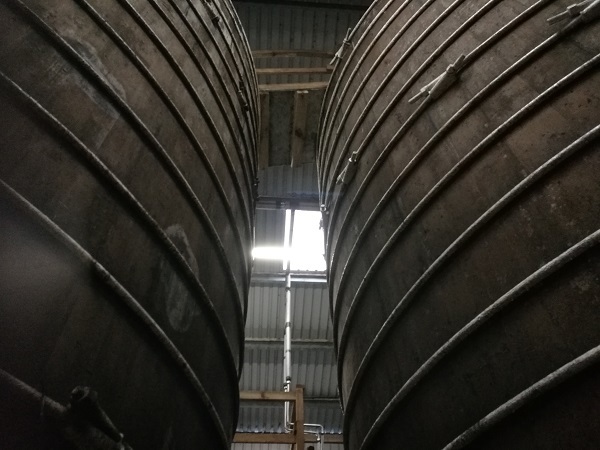 Once blended, some of Thatchers’ ciders are transferred to oak vats – built by shipbuilders 150-160 years ago and maintained yearly – to smooth out the tannins; rather than to add an oaky flavour. When ready, the ciders are bottled, kegged and canned on-site too. Thatchers’ Jubilee Building is home to their packing facility – and they’re building a new distribution centre out the back too. Built in 2016, it wasn’t running on the day of our visit, but the numbers show just how vast the operation is: last year saw Thatchers produce around 58m cans alone – this year, they’re on track for 66-68m. And it’s nice to see that they’ve shunned the nature-unfriendly plastic rings that generally hold packs of cans together: instead, they use recyclable cardboard. Tour over, we retreated to our starting point for a little tasting session – if you book onto a tour for the princely sum of £12 per person, you’ll have the same waiting for you at the end too… We started with the Katy – a light and refreshing (yet 7.4%) sparkling eating apple cider, and interestingly, Thatchers are the only Katy cider maker in the country… Our tasting continued through the range with both bottled and draught ciders on the table, from the almost creamy oak chip-infused Redwood to the draught Stan’s, with a far greater depth of flavour. And then it was off to The Railway Inn for lunch (which I’ll cover in a separate post), and a quick jaunt to the gift shop a short hop down the road, where you’ll find the entire Thatchers range (including their apple gin and apple wine), alongside souvenirs and other local produce, from cheeses to fudge. There are plenty of cider farms in the South West that offer tours, most of them the smaller cider makers whose output is far less prolific. It was really interesting, though, to see how Thatchers make their ciders on such a large scale, while still maintaining as much of that original small, family-run feel and ethos as possible. And while it might seem like marketing spiel, I’ve now seen it first hand. 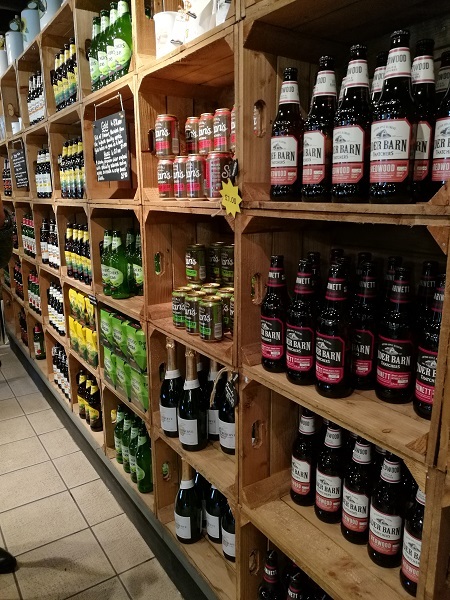 For some cider fans, the Thatchers range may not set the world alight: most of their range is pretty safe, middle-of-the-road, mainstream choices – but done well, and done consistently. And if you want to book onto a tour to see – and taste – how they do it for yourself, you can do so via their website. Please note: this tour was received free of charge, but in no way impacted on our opinion. We were not obliged to write a positive account, and the company did not see this write-up before it was put up on the site.